Comments: The first leg of U2's Innocence + Experience tour comes to an end with the last of eight shows in New York City's Madison Square Garden. And the celebration was on, especially after the intermission. 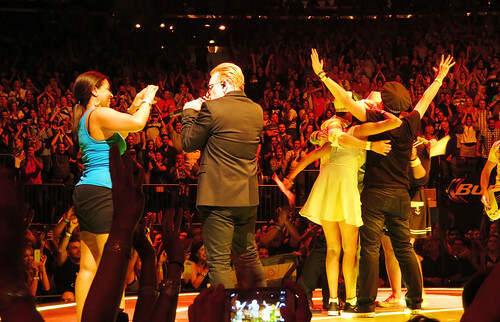 During "Desire," Bono brings a handful of fans on stage -- it's some of the team from Brazilian fan site U2BR.com, and they're dressed similarly to how U2 was dressed in the "Discotheque" music video. (They've previously talked to Bono about adding that song to the setlist.) But rather than mention the "Discotheque" connection, Bono jokes that they look like the Village People. A song later, Bono breaks out champagne during "Party Girl," which is played for the first time since July 7, 2009. During the encore, a long-running rumor finally comes true when Bruce Springsteen joins U2 on stage for a medley of "I Still Haven't Found What I'm Looking For" and "Stand By Me." The crowd roars and yells "Bruuuuuce" in Springsteen's honor as he takes the stage after a short introduction from Bono. The show ends with "40," which Bono dedicates to Dennis Sheehan, the band's former tour manager, who died after one of U2's concerts in Los Angeles earlier this year. One pre-concert note to pass along: The crowd gets loud before U2 takes the stage, when President Bill Clinton and wife Hillary are spotted taking seats in the first row of the second level. One post-concert note to pass along: After the show, U2's official website and social media accounts send out a message thanking the U.S. and Canada, and also telling fans in those countries, "see you soon." We have 1 reviews and 6 photos from this show.